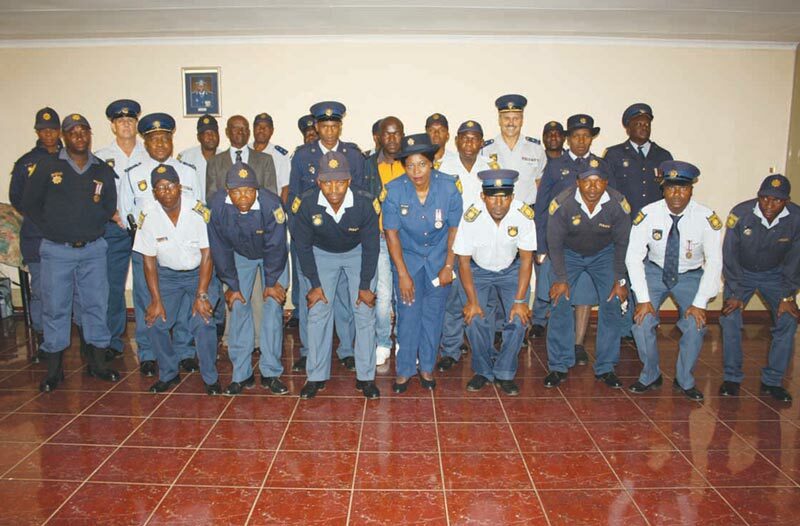 On Friday, 15 February, SAPS officials of the Mkhondo Cluster received their loyal service medals for long service. The event took place at the Cluster office and opening and Prayer was conducted by Warrant Officer Lukhele. The welcoming of the guests and honourable officers was handled by Lieutenant Colonel P.P.Z. Mtetwa and Colonel Mbongwa addressed the audience by explaining to everyone what the purpose of the gathering was. After Colonel Mbongwa’s inspirational speech, Cluster Chairperson of the CPF (Crime Prevention Forum), Mr M.M. Lushaba gave a word of thanks to the officers of Mkhondo who have been putting their lives at risk to serve and protect the community and Brigadier A.J. Gous stated that when he started in Mkhondo in 1994, many of these officials were already serving in the SAPS. He congratulated the men and women for their hard work and dedication. 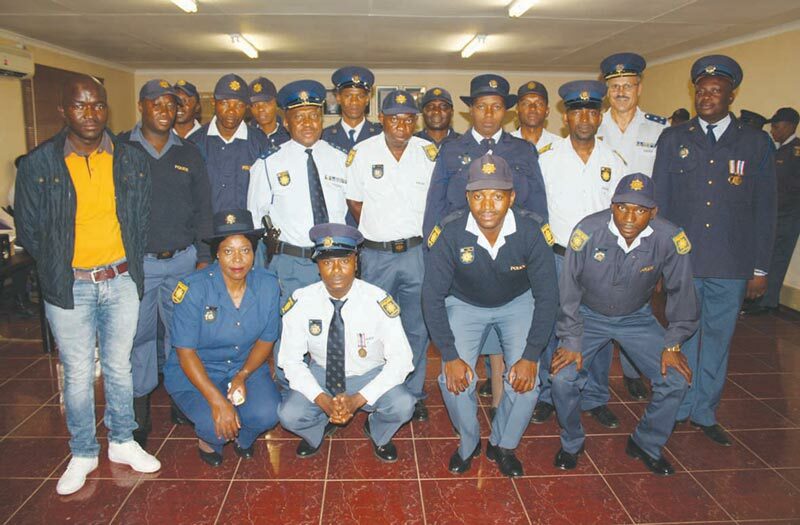 He said that they are truly dignified members of the SAPS. Lieutenant Mtetwa read out the Loyal Citation for the 10 – and 30 year medals as Brigadier A.J. Gous, Colonel J.W. Mbongwa and Mr M.M. Lushaba handed out the medals. Congratulations to the following members for receiving a 10 year (and longer) Loyal Service Medal (40 officials): Constables S.D.C. Zwane (Piet Retief CIS), T. A. Maseko (Amsterdam), N.N. Masina (Mahamba), J.D. Fakude (Amsterdam), J.E. Nkosi (Mahamba), D.A. Nkosi (Piet Retief CIS), P.S. Masuku (Sheepmoor), L.D. Lukhele (Dirkiesdorp), Z.Z. Mtungwa (Piet Retief CIG), X.J. Manana (Piet Retief), P.D.K. Mphathe (Bothashoop), K.H. Thwala (Piet Retief), D.J. Mbonane (Sheepmoor), B.N. Nyoni (Piet Retief), S.J. Ntombela (Mahamba), S.H. Malinga (Piet Retief), H. A. Sukazi (Piet Retief), M.B. Dladla (Piet Retief), M.H. Macu (Mahamba), S.I. Magagula (Mahamba), J.M. 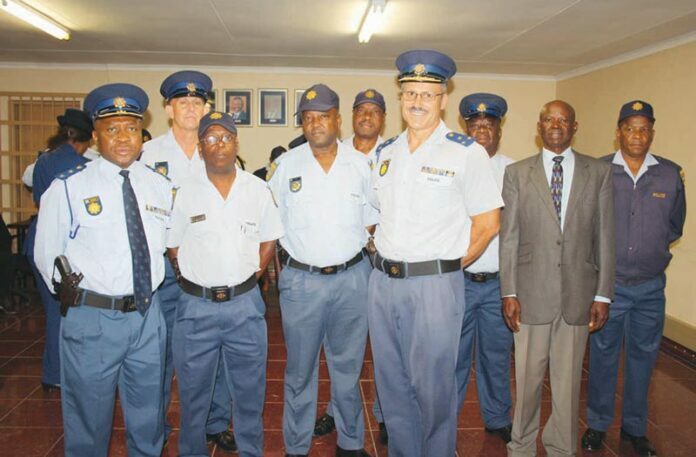 Msibi (Mahamba – Reservist Constable), G.D. Mdhluli (Piet Retief), W.C. Mavuso (Mahamba), W.T. Mahlangu (Piet Retief), M. Sikhwari (Sheepmoor), N.E. Dlamini (Mahamba), H. Nkosi (Amsterdam), E. Shakwane (Sheepmoor), B.G. Masina (Piet Retief), N.H. Phakathi (Piet Retief), M. A. Nkosi (Amsterdam), S.G. Nkosi (Dirkiesdorp), T.D. Leshaba (Piet Retief), J.E. Thomo (Amsterdam), R.L. Murivhani (Mahamba), I. Siqauque (Sheepmoor), D.S. Vilakazi (Piet Retief), N.O. Msibi (Mahamba), T.C. Nkambule (Amsterdam) and M.C. Mnisi (Amsterdam). Congratulations to the following officials for receiving a 30 year (and longer) Loyal Service Medal (15 members): Captains N.V. Xulu (Mahamba), P.N. Hadebe (Piet Retief), P.B. Mbuyazi (Piet Retief STU), L.J. Fourie (Nerston Police), S. Gous (Piet Retief) and K.H. Cele (Piet Retief CC). Warrant Officers J.N.B Taljaard (Piet Retief), T.D. Tsoeu (Emahlatini Port of Entry), J.D. Nyathi (Dirkiesdorp), R.B Coka (Piet Retief), J.H. van Barneveld (Piet Retief STU), W.P. Biyela (Mahamba Port of Entry), J.D. Nkosi (Piet Retief), E.C. Mathenjwa (Piet Retief) and D.P. Khumalo (Piet Retief). The event was concluded by Lieutenant Mtetwa inviting the guests to enjoy a cup of coffee and finger snacks to celebrate these achievements.